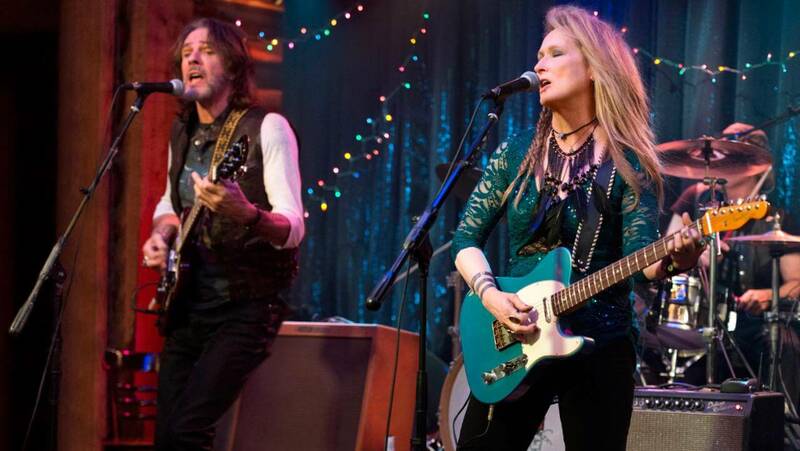 I fell for Ricki and the Flash’s embarrassingly enthusiastic advertising run—the poster of Meryl Streep in full rock star garb and numerous TV spots in which she praises her latest project. I fell, and I fell hard. Ricki and the Flash should have been the ultimate Meryl Streep Movie. In the three years since her third Oscar win, the public has never been more susceptible to Streep’s charm. As a particularly affectionate member of said public, I was looking forward to seeing Streep’s real-life daughter, Mamie Gummer, play her on-screen daughter. The only thing better than one Meryl Streep is two Meryl Streeps. It seemed a winning combination: Streep acting under Jonathan Demme’s (The Silence of the Lambs) thoughtful direction, with material from the “queen of quirk” screenwriter Diablo Cody (Juno). Although Streep and Gummer’s on-screen chemistry did not disappoint, Demme and Cody’s did. Demme, who normally gives his characters’ relationships the development time they need, moves through Cody’s dialogue at breakneck speed. And while Cody’s screenplay is far from perfect, it has the trademark unapologetic humor that won her an Oscar for Juno. Ultimately, Demme’s haphazard pacing makes most of the jokes fall flat and turns the characters bland instead of funny. Ricki Rendazzo (Streep) is a broke, aging musician in Los Angeles who abandoned her family decades ago to seek success she never found. She spends her days bagging groceries and her nights playing bar gigs with her equally washed-up band mates, including her boyfriend, Greg (Rick Springfield). But Ricki is behind the times, no matter how many pop songs the band learns, or how long Ricki’s (vaguely culturally appropriative) braids grow. She hasn’t accepted that she lost the bid she took on her dreams all those years ago. When Ricki’s ex-husband Pete (Kevin Kline) calls to say that their daughter Julie’s husband is leaving her, it is the most interesting thing to happen to Ricki in years. At Pete’s encouragement, Ricki flies home to Indianapolis to help Julie (Gummer) recover. When Ricki’s taxi takes her to Pete’s McMansion in a gated community, it’s clear that she doesn’t belong. The fish-out-of-water dynamic doesn’t play well. Ricki is far too irresponsible, too unconventional for one to believe she could have been a part of her family’s bougie wonderland. Pete’s second wife Maureen (Audra McDonald) is a much better fit. Marueen has been more of a mother to Ricki’s children, even paying for the children’s Mother’s Day gifts for Ricki, as Maureen points out in one of the film’s best-acted scenes. In a move intended to put a twist on the family comedy-drama, the conflict between Ricki and Julie is resolved too early. There’s still an hour left in the film–plenty of time for more songs and insincere self-discovery. I salute you, Mamie Gummer. The fact that you’re in show business at all is brave considering the shadow you live in. But agreeing to do a movie with your mother (although it’s not the first time you two have shared the screen) was an astounding act of courage, and you held your ownGummer has her mother’s gift for facial expressions, as evidenced in the film’s climactic wedding scene, in which we see Julie’s vulnerability delivered in silence. As she should, Streep shines in the musical performances, capturing Ricki’s eager rock star persona. She sings and plays the songs (Streep learned a few guitar chords for the role) with a gritty vocal versatility unexpected after her respectable-but-not-wonderful vocal performances in Mama Mia! and Into the Woods. She might even rack up her 20th Oscar nomination. At this point in her career, Streep can do no wrong—even when the movie doesn’t live up to expectations.